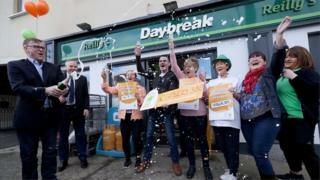 A member of the Irish family syndicate that won a €175m (£150m) Euromillions jackpot has spoken about the big win. Gerry Browne, husband of one of the the winners, told RTÉ radio he thought he would have to call an ambulance for his wife after she had checked the numbers. He said the past week had been hectic and "hard to believe it really". "When we saw jackpot was €175m, we asked ourselves 'Is it real?' and 'What if the house goes on fire and burns the ticket?'" Mr Browne said. Having informed her fellow syndicate members of their massive good luck, Mr Browne's wife "put the ticket in an Argos catalogue on the table until the next morning". The nine-person syndicate collected the prize from National Lottery offices in Dublin on Wednesday. Asked if he got any sleep on the first night, Mr Browne said he had "about six vodkas so I slept pretty alright". A keen club cyclist, he intends to spend "€14,000 or €15,000" on a new bike. The Brownes do not intend to move out of their home town of Naul in north County Dublin. The win is the biggest ever EuroMillions win Ireland. In January, a couple from Northern Ireland won a EuroMillions £115m jackpot.